However apart from cooking with coconut oil or ingesting it, you can use coconut oil for your skin and hair. Remember, unrefined, organic, cold-pressed virgin coconut oil is your best option (and should always be used when taken internally). Virgin coconut oil is processed without chemicals that damage its natural compounds which makes it so good for your hair and skin. You can find it in many supermarkets, health food stores or online. 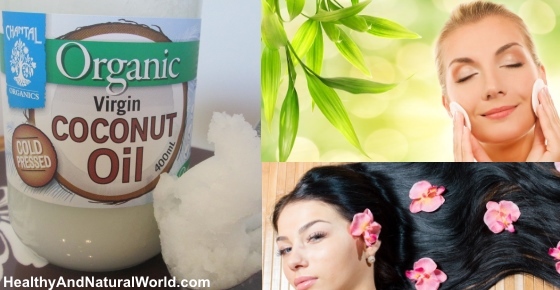 In this article I will show you versatile ways to use coconut oil on your skin and face as well as your hair – maybe it’s time to replace your expensive commercial hair and skin products with a cheaper and natural alternative – you’ve got nothing to lose. Coconut oil contains medium chain fatty acids (MCT), in which lauric acid is the most well-known of them. These fatty acids nourish and moisturize the scalp and hair. Virgin coconut oil can strengthen, protect, rejuvenate, and give a beautiful shine to your hair. Coconut oil is solid at cold temperatures but melts at 76 degrees F (24.5 C) or above. So if your coconut oil is solid, measure a few tablespoons of coconut oil (depends on your hair length) in a cup and heat in the microwave until it has melted (or place the cup in a bowl of warm water to melt it). A study published in 2003 in the Journal of Cosmetic Science found that coconut oil was the best in preventing damage to the hair shaft when compared with sunflower oil and mineral oil. The study found that coconut oil is a rich source of lauric acid and has a high affinity for hair proteins. Because of its molecular properties, it can also penetrate deep inside the hair shaft. So if you have damaged hair, massage your scalp with coconut oil to heal the damage that is caused to your hair. If your hair is frizzy and dry, you can use some coconut oil to moisturize and smooth the hair to prevent frizz and tame your hair. This is especially useful if you have curly and dry hair which is prone to frizz when you brush it, so put a little bit of coconut oil on your fingers and run them through your hair. Depending on the length of your hair and how dry it is, you may require more coconut oil to thoroughly coat your hair. Work with small amounts to avoid ending up with an oily look. You can also apply the oil only over the ends of the hair rather than over all of it. If you want to add shine and luster to your hair, you can use coconut oil as a deep conditioner. A study published in the Journal of Cosmetic Science in 2007 found that when coconut oil was applied to the hair, it slowed the loss of moisture and had an effect similar to moisturizing of hair. To achieve a shiny and moisturized hair wash hair as normal and do not blow dry. Then massage coconut oil throughout your hair. You can add a few drops of your favorite essential oil into the coconut oil to add a nice scent or to enhance the benefits for your hair. Wrap the hair in a shower cap or with a towel and leave for at least an hour or two, or preferably overnight (the longer you wait, the more conditioned your hair will be). Remove cap or towel and shampoo as usual to remove oily remnants. You may need to wash your hair twice with your shampoo until all the oil has been completely removed. If you want, you can use apple cider vinegar (ACV) hair rinse afterwards (see more details in my previous article why you should wash your hair with ACV). Let the hair dry to see it soft and shiny. Repeat this treatment when your hair starts feeling dry (depending on how dry the weather is or how often you use hair iron). It can be done once a week or less often. Virgin coconut oil has many antibacterial and antifungal properties that can help clear up dandruff and treat an itchy and dry scalp that is caused by dermatitis or a yeast infection. Regarding the antifungal activities of coconut oil on the Malassezia fungus species, the Indian Journal of Medical Research reported that coconut oil can help prevent dandruff that is caused by a fungal infection. Another study published in 2008 found that coconut oil helps to reduce the symptoms of dermatitis, including dry and itchy skin. To keep dandruff at bay, use the above treatment for deep conditioning and repeat 1-2 times a week to keep your scalp moisturized and free of dandruff. Coconut oil is a natural moisturizer not only for the hair, but also for the skin. It helps to soften the skin and is especially good for dry skin. It may also help to treat eczema due to its anti inflammatory properties. Coconut oil is better than many commercial moisturizers that contain petroleum-based ingredients and a lot of water. The water content makes you feel as if your skin is being moisturized, but when the water dries, your skin becomes dry again. Coconut oil, on the other hand, is a deep moisturizer that nourishes the deeper tissues. You can also boost the benefits of coconut oil by combining it with one of the top essential oils for skincare. The journal Dermatitis showed that coconut oil helps to soothe and moisturize itchy, dry, scaly skin and is as effective as mineral oil as a moisturizer. Some people may experience allergic reaction when coconut oil is applied to their skin. Therefore before applying coconut oil on your skin, it’s always recommended to do a patch test prior to using it for the first time. If you develop swelling, redness and inflammation on skin where it was exposed to coconut oil, wash it off and avoid using it. The reason why coconut oil is especially effective as a skin moisturizer when compared to other natural oils is that a study found it easily penetrates the skin. The study found that the lauric acid in coconut oil easily penetrates deep into the skin and stays in the dermis. This provides a strong protective barrier on the skin’s surface and keeps it free from impurities. To use coconut oil as a natural moisturizer for dry skin, apply coconut oil to your face after every time you wash.
As coconut oil is easily absorbed into the skin, the key is to only use a little amount for moisturizing. Start with a small quantity (a pea size) and apply around your eyes and face, and even your lips if they are dry and chapped. At first it tends to have a greasier consistency, but it will get absorbed into the skin. You can also enjoy the moisturizing effect of coconut oil when using it in facial scrubs. All you need to do is to mix melted coconut oil with sugar and a few other ingredients such as essential oils or other carrier oils. The nourishing properties of coconut oil help to keep your skin radiant while the sugar gently exfoliates to remove dead skin cells and unblock pores on your face. Because coconut oil is anti-inflammatory, it will help to reduce the appearance of blemishes and redness on your cheeks and face. For example, the journal Dermatitis published a study showing that coconut oil effectively cures the symptoms of atopic dermatitis (most common type of eczema) due to its antibacterial activities and the emollient effect of coconut oil. Another study found that coconut oil is also a natural anti-inflammatory agent that can help to reduce redness and itchiness, which is also a symptom of many skin conditions. To soothe inflamed, itchy and red skin massage virgin coconut oil directly onto your face or other skin areas. Apply the coconut oil 2-3 times a day until the itchiness and red skin have gone for good. You can use coconut oil to reduce facial wrinkles and prevent premature aging. When we get older, collagen in the skin breaks down and the skin loses its elasticity and wrinkles start to appear. A study showed that virgin coconut oil helps wounds to heal quicker because its components help to boost collagen production. More collagen in the skin means that it looks more youthful and has less wrinkles. Apply a small amount of coconut oil on your face in the morning and night as your daily moisturizer. Regular use of coconut oil on your face and neck can help to keep your skin hydrated and prevent collagen loss. The nourishing properties of coconut oil can help to prevent the signs of premature aging and keep your skin looking youthful for longer. One study published in the Journal of Investigative Dermatology found that lauric acid (the main fatty acid in coconut oil) showed strong antimicrobial activity against Propionibacterium acnes – the bacteria responsible for inflammatory acne. Although coconut oil is comedogenic (comedogenic means that it can block pores), you can still use coconut oil for oily skin. The best way to find out if coconut oil will help clear up your acne is to try a small amount on a small area of skin. You can also enhance the antibacterial effect of coconut oil by adding a few drops of tea tree oil which is one of the best essential oils for acne. Mix 4 drops of tea tree oil with a tablespoon of coconut oil and store in a glass jar. Apply a small amount of coconut oil on your face 2-3 times a day and repeat applying the remedy until the acne has gone. You can use coconut oil as a make-up remover. Using gentle circular motions, massage some coconut oil to your face to remove your makeup. Use a warm, wet washcloth to remove excess oil and makeup. Rinse your face with warm water. Lip moisturizer. Massage a small amount of coconut oil to your lips any time you need to soothe cracked, dry, and chapped lips. Natural shaving gel. Applying coconut oil to your face before shaving is a great way to soften the bristles and prepare the skin for shaving. The advantage of using coconut oil as a facial shaving cream is that its antibacterial activity helps to protect the skin from infection. The moisturizing effect of coconut oil means that you may not have to put any moisturizers on your face after shaving. However, if you need to, you can also use coconut oil as a skin moisturizer. Sunburn relief. Sun damage can dry out the skin and cause it to lose its elasticity. To use coconut oil to get relief from burned and damaged skin, apply coconut oil directly to the affected skin. Repeat 2-3 times a day to soothe burned skin on your face to heal and reduce redness quicker. MY daughters use coconut oil and have beautiful hair and skin! I use coconut oil on my face and neck daily…I use it as moisturizer under my makeup. Love love love it! Some ingredients are not available or easy to find in certain countries, but unfortunately I’m unable to research what’s available in any country or how to get it. Generally speaking, if an ingredient is not available in a physical location, such as supermarket, health store or herbal shop, there will be a need to research whether it’s possible to order it online. I can’t handle the smell of coconut oil, can it be mixed with an essential oil? Yes, you can. Coconut oil is often used as a carrier oil which means that essential oils can be added to it. There is a brand of coconut oil that Sams club sell, that has no scent. I like to use it to cook with, mostly. I personally love the scent, so use the “scented”one for my skin and hair. The brand is, Barleans, Organic virgin coconut oil. It comes in a black container, 60 fluid oz. I think it runs about 18.00 dlrs. I mix with 10 drop of Monoi oil with coconut oil and use for body moisture. Can I use Coconut Oil as a moiturizer during the day beccause from where I come from we have a lot of sun, so will it be safe for me to use it during the day too??? Hi Rosemary, coconut oil is NOT a safe alternative to sunscreen, so you still need to protect your skin with a sunscreen. Very usefull and nice tips . This info is very good. Dont know if this would make any difference but i always put coconut oil on my face and hair before i have a bath/shower. I have read in alot of articles that you should put it on afterwards but i find its much easier letting it soak into your skin and hair for about half an hour and then you can just wash it off & shampoo your hair and when your out the bath your face is already smooth and moisturised rather than being dry form the hot water. Also I dont really use microwaves i prefer a more natural form of cooking food so i dont really see the point of using organic natural coconut oil and then wacking it into the microwave to melt. if you scoop up some coconut oil it just melts in your hand anyway. Hope this is a useful for someone. So does the oil smell like coconuts then?? I’m not sure I’d like to have people keep saying, “why do I keep smelling coconuts”, or that I’d even like the continuous smell of coconuts. unrefined (virgin) coconut oil smells like coconuts whereas refined coconut oil doesn’t have this smell. The recommendation is to use virgin coconut oil because it retains the plant’s original chemical composition and the plant’s therapeutic benefits. I use retina A cream, can i still use Apple cider vinegar solution as a toner. Hi Deepa, retin A cream makes the skin more sensitive, so if you want to try the ACV toner, start with a low concentration on ACV (a small amount of ACV diluted with lots of water) and do a test on a small patch of the skin to see if there is any reaction. If there is no reaction, increase very slowly and gradually the concentration to see what feels comfortable on your skin. I have been reading about the benefits of coconut oil every where . I have dry skin and dry hair. I start using Virgin coconut oil buy it made my skin more dryer. The same happend to my hair. It made my hair frizzy and really dried out. I am not sure if anyone experienced the same . It did the same for my daughter. Her hair became drier and more rough and her face became drier also..
Hi, is it safe to apply coconut oil together with my body lotion? You can still apply coconut oil on your face regardless of whether you have or don’t have facial hair. Coconut oil cannot reduce facial hair but is still good as a moisturizer. If you want to have a glowing skin, have a look at my article about The Top 8 Vitamins and Nutrients for a Gorgeous Skin and Top 10 Super Foods To Get The Best Skin Ever. My Friend uses coconut oil to lessen fats in her breast, does that really works? Since coconut oil contains fat? Coconut oil is different from most other fats. While most other oils mostly contain long-chain fatty acids (LCT), coconut oil consists almost entirely of medium chain fatty acids (MCT). MCTs are more quickly absorbed by the body and more quickly metabolized (burned) as fuel. The result is quicker metabolism – you can find relevant studies and information in my article “How to Use Coconut Oil for Weight Loss“. However this is not a magic solution and you can find guidelines in my article. Also if you lose weight, you lose it from all the body and not just from one part of it (although when losing weight, many women notice breast size reduction).